On 18 June 2017, New Acropolis conducted a cleanup activity of the mangrove wetlands in the Colaba neighborhood of Mumbai with residents of the locality, associates and volunteers. The mangroves are in dire need of a cleanup, as increasing development and consumption continuously generates garbage which ends up in the wetlands. Timing the cleanup to the low tide, the day’s activities kicked off with a volunteer orientation on sensitivity to the cause and the work at hand. The Volunteers cleaned plastic bags, discarded fabric and other garbage suffocating the mangroves over three hours. The grueling work paid off as volunteers removed 55 bags; almost over 1000 kg of garbage, yet cleaning less than 5% of the immediate space! It was a humbling experience to give back to mother nature and contribute to the development of our neighborhood. In a coastal city like Mumbai mangroves play an important role in the fragile ecosystem. They give more oxygen than landlocked trees, and their submerged root system serves as a nursery for small fish, crustaceans, crabs and other sea life. These plants also trap sediment that flows from rivers and off the land which helps prevent soil erosion resulting from waves and storms. In areas prone to typhoons and tsunami’s mangroves act as a natural barrier from the fury of nature. 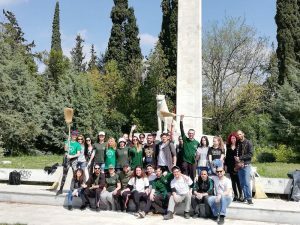 This activity, conducted by the Active Ecology team of New Acropolis once again showcased that volunteering is “Philosophy in Action” and by taking ownership of the city we live in, we can make a difference to our planet, one cleanup at a time!